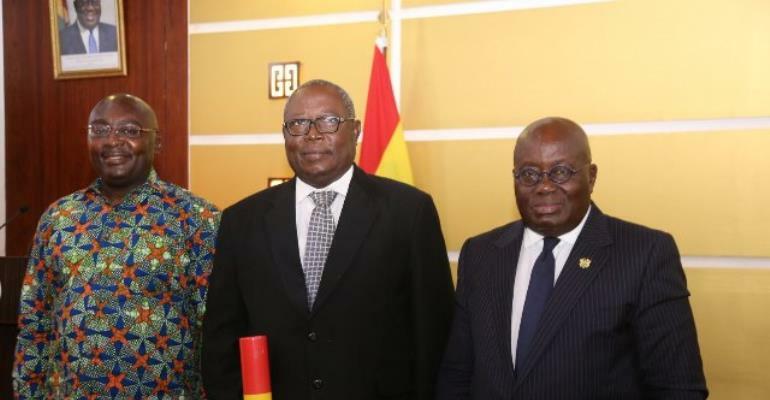 President Nana Addo Dankwa Akufo-Addo has promised to respect the independence of Special Prosecutor Martin Amidu in the discharge of his responsibilities. Let me first welcome you all warmly to the seat of our nation’s presidency. On the second day of this year, I assented to the enactment of the Office of Special Prosecutor Act, 2017, (Act 959). Pursuant thereto, the Attorney-General, Ms Gloria Akuffo, in compliance with the provisions of s.13(3) of the Act, wrote to me, on 11th January 2018, to nominate Mr Martin Alamisi Burns Kaiser Amidu for appointment as Special Prosecutor. I readily accepted the Attorney General’s nomination, and, on the same day, announced his nomination to the country, and, subsequently, on 11th January 2018, I sought the approval of Parliament for the appointment. After a spirited and revealing vetting of the nominee, Parliament, on 20th February 2018, notified me, by letter under the hand of the Speaker, the Rt. Hon. Michael Aaron Oquaye, of its decision to approve, by consensus, the nomination of Mr Amidu for appointment as Special Prosecutor. By the swearing-in of Mr Amidu this afternoon, the process of appointment of the Special Prosecutor, set forth in s.13 of the Act, has been completed. The enactment of Act 959 and the successful appointment of a Special Prosecutor are historic events in our modern history. The Ghanaian people have, in overwhelming numbers, denounced the canker of corruption that has, in recent years, engulfed the public life of our nation to the detriment of our progress. The response of the New Patriotic Party to this strong, popular sentiment, was to pledge, inter alia, in its Manifesto for the 2016 general elections, the establishment of the Office of Special Prosecutor, an independent, non-partisan body, with the relevant professional capability, to lead the fight against corruption, and hold public officials, past and present, accountable for their stewardship of public finances. The Ghanaian people expect the Office of the Special Prosecutor to rise to the occasion, and collaborate with other existing law enforcement agencies, to fight relentlessly, and help eliminate corruption in our public life. We expect the Special Prosecutor to discharge his duties vigorously, with courage, without fear or favour, ill-will or malice, in accordance with the rule of law. The establishment of this Office is for a high purpose, and must not, under any circumstances, be used as an avenue for persecution or vengeance. The Office will be required to do justice to all manner of persons. In his book, “Practice and Procedure In The Trial Courts and Tribunals of Ghana” (2011, Second Edition), the respected, former member of the Supreme Court, Brobbey JSC, reiterated the overriding duty of a Prosecutor in the following words: “Always the principle holds that (the prosecutor) is concerned with justice first, justice second and conviction a very bad third”. The Special Prosecutor cannot do it all by himself. He requires the active co-operation of all the institutions of our state, as well as that of the general public if he is to be successful in the fight against corruption. I have known Martin Amidu for several years. Indeed, I was his opposing counsel in many of the landmark constitutional cases in the early years of the 4th Republic in the 1990s, and can personally testify to the tenacity with which he holds onto his views. That tenacity has now to be exercised in favour of the Ghanaian people in his new office. I congratulate him on his deserved appointment and wish him God’s guidance in the effort he will undoubtedly be making to try to instil integrity and accountability in the governance of our country. The ultimate beneficiaries of his actions, indeed, of the actions of all of us in public office, will be the Ghanaian people. Thank you, and may God bless us all and our homeland Ghana, and make her great and strong.